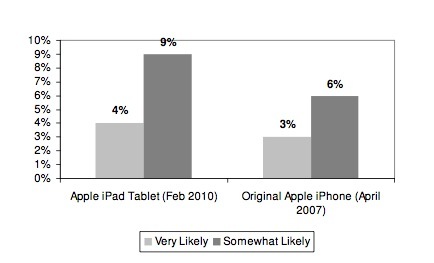 Apple’s recently introduced iPad has been criticized by many analysts as being just a big iPod touch. A new survey, though, suggests that people are really interested in a handheld computer that’s basically a big iPod touch. Even more interesting is the fact that this is nearly 50% higher than the percent of people that were interested in the Apple iPhone when it was announced. Expect lines when the iPad is released.